iFinger is an Internet browser plug-in that gives you direct access to database information, both on and off-line, through a cutting-edge Pop-up feature. The Dictionary of Quotations installs to your hard drive and runs in the background on your PC, so you can consult it whenever you want with no fuss and no waiting. 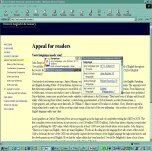 Simply hold your cursor over a word in Internet Explorer, or double click on a word in any windows-based application, and the entries are displayed instantly in a Pop-up window - search for quotes either by subject matter or speaker. This download is the free trial version of Oxford Dictionary of Quotations. The full version can be purchased directly from the author. See program documentation for details.